NEW YORK CITY, NEW YORK — Humanity and spectacle were brought together last night in Madison Square Garden when WBA middleweight title-holder Gennady Golovkin faced off against Curtis Stevens. The bill of “Monsters Collide,” a nod to the other-worldly knockout power both men have displayed throughout their careers, provided the spectacle of the event. Here were two men, two fighters pegged with the label of “punchers,” signifying their higher threat to erasing consciousness and coherence than their peers, who also carry around dual lethal weapons. The puncher is the most unpredictable, the most animalistic of all boxers. He stalks. He seeks to ruin with every shot. He doesn’t listen to “reason” and look to box even when it’s in his favor. Satisfaction only comes when the man in front of him becomes an inert life form at his feet. The flesh and bones being rearranged, the fear on family member’s faces, and the limits of pain tolerance, made Golovkin vs. Stevens another example of one of boxing’s ultimate truths — the duality of the puncher. Before Stevens was floored by a pinpoint left hook in the second, and took on the look of a battlefield soldier who just narrowly missed getting his head blown off, he was a man filled with supreme confidence while fielding media questions in his native New York City. Finding him through his promoter Main Events, Stevens exhibited a calmness that was surprising for a man just days away from a title shot nine years in making against a man widely considered the most vicious puncher in boxing, let alone the middleweight division. We had all heard the stories by this point. 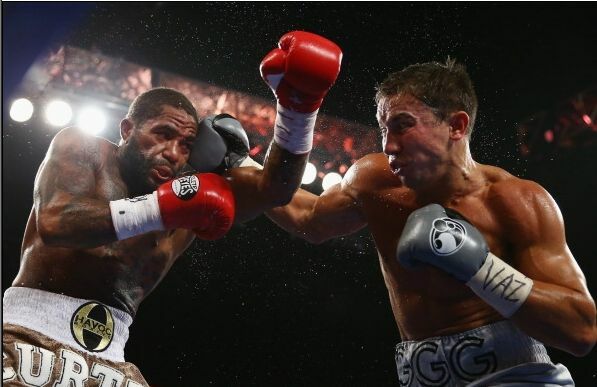 Golovkin regularly spars with and knocks down super-middleweight and light-heavyweight fighters. The footage of him bullying and repeatedly snapping the head back of Julio Cesar Chavez Jr., a fighter who regularly balloons to close to 200 pounds at times, seemed to confirm that. To say Stevens was unimpressed with these facts is an understatement. While never raising his voice or expressing overt disgust, that timbre of his words carried a sense of the incredulous. For him, the punching power of Golovkin was smoke n’ mirrors, the result of easy match-making and the overindulgence of beat writers mesmerized by the sudden distruction of a knockout without factoring in the quality of the recipient or the deliverer. And there lies the puncher’s biggest attribute — the faith that the universe could not have possibly created another mortal that could withstand the power they hold in their fists. Not Golovkin, not anyone. Even though his record is littered with seven decision wins and several knockout losses on his own, that was just because the right shot wasn’t landed (“Lesson I learned from those fights is to throw more punches,” Stevens claimed). There can be a thin line between faith and delusion. For Golvokin trainer Abel Sanchez, Stevens’ pre-fight talk put him in the latter category. As powerful as faith is, it can be dampened. It can be shattered and lost under the most dire circumstances. 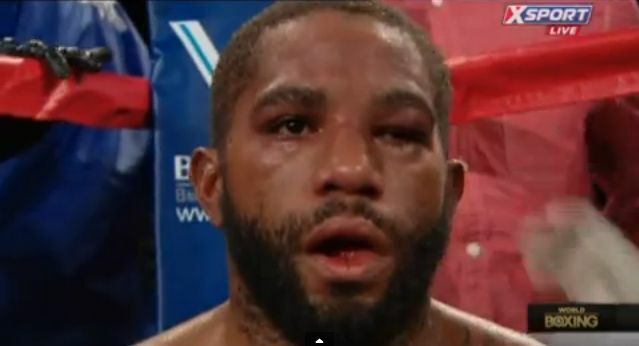 Curtis Stevens may be too proud to admit it, but his face told no lies when Golovkin’s left hook toppled him on his back, feet and legs rigidly locked momentarily in the air like a dead insect. After a give and take first round where Stevens landed several patented left hooks, Golvokin’s own left hook brought home the reality that had Macklin and Rosado’s eyes resembling saucers at different points in their GGG bouts. If a microphone could have been shoved in Stevens’ face at that exact moment, he would have confirmed what all punchers painfully find out at some point in their careers — I am not alone and the universe has blessed others with greater gifts. He learned the duality of the puncher is kill or be killed. Every puncher, like a lion in the jungle, will vanquish and eventually suffer the same fate. The knockdown put the final draft of the bout’s script in both fighter’s hands. Golvokin was the more skillful, more seasoned fighter with a better punch and the means to get them there. Hard, thudding jabs keep the shorter Stevens on the end of slashing body shots and looping right hands. Stevens played the part of the admirable but doomed challenger, who could at times show flashes of hard resistance (like the fourth round where a series of hooks off the ropes backed up Golovkin to ring center). but ultimately would not be able to withstand the constant pressure and beating his body was receiving. Stevens’ mother could be seen walking out the theater when Stevens took heavy punishment in the latter rounds. During the eighth, which saw Stevens seek refuge in every corner only to get clubbed with power shots each time, had Mama Stevens throwing her hands up in exasperation that this was still being allowed to go on. The referee and corner wisely called the fight after the eighth with no protest from Stevens. On the way to the ring, Stevens was sporting a red “WAR” baseball cap, made famous by middleweight legend Marvin Hagler preceding his classic slugfest with Thomas Hearns. Unlike the Marvelous One, Stevens lost his battle in decisive fashion. However, war as a metaphor for a boxer’s active career still remains. Stevens’ effort will no doubt earn him another premium network appearance and the options are varied in the 160-pound division. Names like Bryan Vera, Gabe Rosado or even David Lemieux are intriguing matchups. As for Golovkin, his sights are on a lion in winter named Sergio MArtinez, who he called out in HIS post-fight interview. With that fight not being an option until mid-2014, Golovkin has already locked in a date for February 1 in Monte Carlo (likely against #1 contender Martin Murray). For now and the foreseeable future, Gennady Golovkin remains on the favorable side of the puncher’s duality. He is the destroyer over the ravaged. The universe is smiling over him… and so are boxing fans.